One of the most respected websites available for selling your art is FineArtAmerica. They are wholly FREE to sign up with and have up to 30 items for sale. They only charge once you go past 30 items. And that charge is a flat rate of only $30 per year. So it’s well worth signing up! FineArtAmerica is fairly straightforward. You load up a profile photo and a bio. Then you begin loading in your art. You choose a JPG image from your hard drive. You can give it a title and description. Based on the size of the image you upload, the Fine Art America system automatically figures out what size prints it can offer. 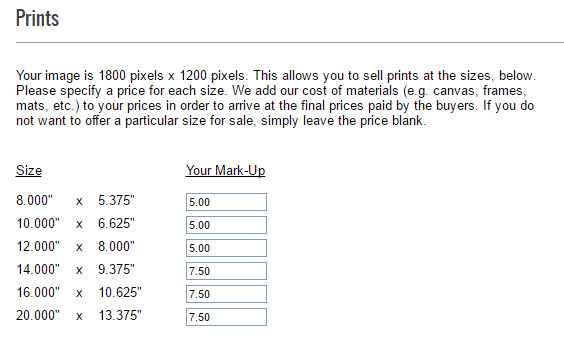 For each print size, you’re allowed to set your markup from their base printing costs. So here are some example markups, based on print sizes. Let’s say John Smith comes along and really likes your image of a black horse. They order a print. They pay the money to Fine Art America. Fine Art America takes care of all processing and shipping. Then Fine Art America sends you a check for your markup, whatever you chose. So it is wholly up to you how much you earn per sale as your share of the cost. They offer a 100% money back guarantee to the person ordering the product so it is pretty much risk-free to the buyer. They prints I have ordered from them have been very nice. I feel their suggested markups are thin. Particularly on items other than prints. e.g. for bags, pillows and the like. As I add my more liked items, I either mark those up to what I consider reasonable or don’t offer the item. Leaving a price blank makes the item not available. Some of the soft goods need to be manually re-centered. They will center a print on a square bag even if the focus is off-center. Most of my prints won’t work for cell phone covers. There are stories about problems with them and artsy prints. if something is intentionally blurred or soft they may not print it. One story has them canceling a seller’s account when they tried to explain the picture / complained when they wouldn’t print it. You can customize your storefront. I just looked at mine and the customization disappeared – need to look onto that. You can use either the fineartamerica.com or pixels.com for your links. You can also turn international sales on or off. One more very big item – they sell nonstandard crops. I like that as few of my crops are standard, but a buyer of a print may be put-off by a print that is 6.57×10 that mandates a custom frame. It also means that they must recenter and crop almost every image they buy. Interestingly, some buyers don’t understand that and choose the often-weird default crop. I don’t want to figure all of the crops that work for each of my pictures and only put prices in for those. Too much work for a long-shot sale. Here are the BVAA members currently using Fine Art America. Let us know if you’d like to be added to this list! If you have more thoughts on Fine Art America, please let us know!